Combined with more than 170 years of manufacturing and quality control expertise, the formulation of Winsor & Newton Artists' Oil Color ensures the best raw materials are made into the world’s finest colors. Winsor & Newton Artists' Oil Color is unmatched for its purity, quality, and reliability — a success that is reflected in its worldwide reputation among professional artists. Winsor & Newton uses only the purest of pigments in the manufacture of its Artists' Oil Color line, ensuring the cleanest, brightest colors, which in turn produce the best color mixtures. Maximum quality control throughout all stages of production, plus the selection of the most suitable drying oils and pigment dispersion methods, ensure that each color's properties are preserved. 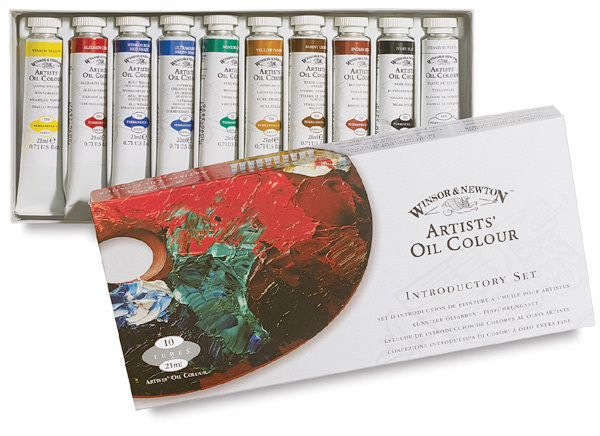 The Winsor & Newton Artists' Oil Color range offers a wide and balanced spectrum of 120 colors in a variety of sizes. Each color has been specially selected to offer the greatest choice and flexibility, ensuring that artists obtain a palette that is best suited to their work. Winsor & Newton's quality standards include the use of single pigments wherever possible to create individual colors. Combined with strength of color, single pigments provide a wide color range in themselves and offer cleaner, brighter mixtures with an infinite range of hues. This is particularly important for greens, violets, and oranges. There are 80 single pigment colors in the Artists' Oil Color range. Winsor & Newton has also developed permanent alternatives for the less durable traditional colors, without compromising the handling properties consistent with oil paints. Of the 120 colors in the Winsor & Newton Artists' Oil Color range, 119 are now classified as "permanent for artists' use," which aids the longevity of paintings. Although Alizarin Crimson is only given a "B" rating (moderately durable), it has been part of the Artists' Oil Color range for more than 130 years and is still considered a key color by many contemporary artists. Because every Winsor & Newton Artists' Oil Color contains the maximum pigment consistent with good handling qualities, it achieves the optimum tinting strength when reduced with White. Winsor & Newton Artists' Oil Colors remain soft and wet for several days, allowing ample time for rework. All colors become touch-dry in thin films within 2 to 12 days. Introductory Set of 10 Colors — This set contains 10 colors in 21 ml (0.7 oz) sample-size tubes, including Alizarin Crimson, Burnt Umber, Indian Red, Indigo, Ivory Black, Titanium White, Winsor Blue (Red Shade), Winsor Green, Winsor Yellow, and Yellow Ochre. Click here to see more detailed information from Winsor & Newton on their classic Artists’ Oil Color. Learn why Winsor & Newton Artists' Oil paints have been a popular choice for so many fine artists.